When you are ready to begin your Disney vacation planning, and if you have a very tight budget, then consider one of the Disney’s All Star Resorts in Walt Disney World. They are: Disney’s All Star Sports Resort, Disney’s All Star Music Resort, and Disney’s All Star Movies Resort. All the resorts are wonderful and you get to be in the middle of the Disney Magic. 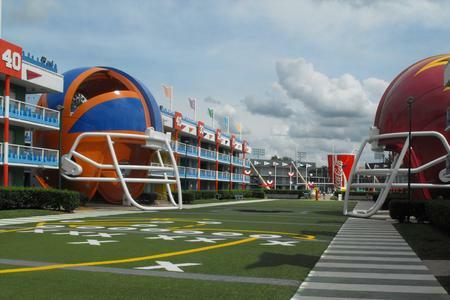 Each All Star Resort contains huge icons to go along with the resort’s theme. They all contain standard and preferred rooms, which have 2 double beds. The rooms sleep up to 4 people and a child 2 and under in a pack-n-play. The preferred rooms are closer to the food court and the transportation bus stops. The resorts have large outdoor pools. The resort food courts have numerous choices for breakfast, lunch, and dinner for every family! Disney’s All Star Music Resort also has family suites that sleep up to 6 people and a child 2 and under in a pack-n-play. These value resorts will keep some of your hard earned money in your pocket! Get a Free Quote for Walt Disney World!